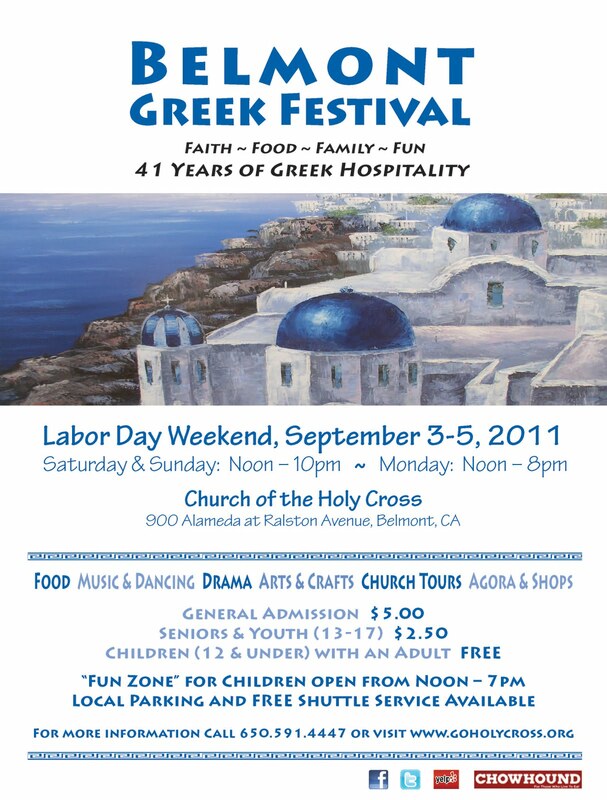 This Labor Day Weekend, September 3-5, the Greek Festival will take place in Belmont's Church of the Holly Cross. Besides vendors who sell jewelry, dresses, and ceramics, there is going be a lot of fun activities for kids, an open bar for the adults, and lots of good food for all. If you're in the mood for a fast food style Greek food, you can munch on fried calamaris, gyros, souvlaki, loukaniko, lamb chops, and a whole lamb roasted on a spit over open fire in the outdoor area. And don’t worry my veggie and vegan friends, they’re also offering two vegan dishes (small lima bean soup and green beans in tomato sauce). Loukoumathes (Greek version of donuts, deep fried fluffy dough served with honey and sprinkled with walnuts) – amazingly fresh and yummy! I was lucky enough to participate in making the Moussaka along with 40 other volunteers, so I'm really sad that I will have to miss the festival since I'll be spending my time in the Yosemite (I'll be thinking of all the good food while torturing my body through hiking and biking). So grab your friends and family, and head to Belmont this weekend to experience some Greek hospitality and don't forget to think of me while you're indulging on great food.